A few years ago, I had an idea for a sound art project. Now, I should warn you that I’m neither an artist nor a sound engineer, but this one seemed (like so many other discarded ideas) like a good idea at the time. It would be called “Albums I’ve Fallen Asleep To,” and it would consist of recordings of the inner tracks of great record albums. You know, that place in the vinyl record where the groove links back to itself and, if you grew up without a “fancy” turntable with an auto-return arm, the needle would just get stuck, going round and round until someone got up and gently returned it to its cradle. I thought this would be a great project, of more conceptual than audible interest, but I thought it would make for interesting listening, nevertheless. CD’s, no matter how scrupulously re-mastered they might be, never reproduce the sound of the needle endlessly circling something we weren’t supposed to hear in the first place. Or, if we did hear it (over and over and over and over), we certainly weren’t supposed to pay attention to it. I never made the recordings because I got hung up on which records to choose. As a kid, I listened to my parent’s two Beatles albums (Magical Mystery Tour and Help! ), because they were the only ones I really liked. I could have begun with those, I suppose, and added The Story of Star Wars, which essentially took the dialogue of the movie and put it on record (To be clear: this was not the John Williams musical soundtrack, but the actual sound track of the film.) And then there would be the Grease! soundtrack and, of course, Free to be You and Me. But then I started wondering: what about those “great” records. Their inner grooves are probably way more interesting than the peculiar audio of my own childhood. What about Miles Davis’ Kind of Blue or David Bowie’s Hunky Dory? Van Morrison’s Astral Weeks or Marvin Gaye’s What’s Goin’ On? Surely, I thought, those had more engaging outros, audible artifacts that one was not supposed to listen to, but that (a) were probably worth listening to and (b) probably had a lot more people fall asleep and then wake up to them than did The Story of Star Wars. In short, I started fetishizing the vinyl. Where could I get a first pressing of these albums, and who would be foolish enough to lend them to me? Of course, I wanted first pressings because I wanted the closest relationship to the original source, which in this case was the record album, but not necessarily the music it contained. 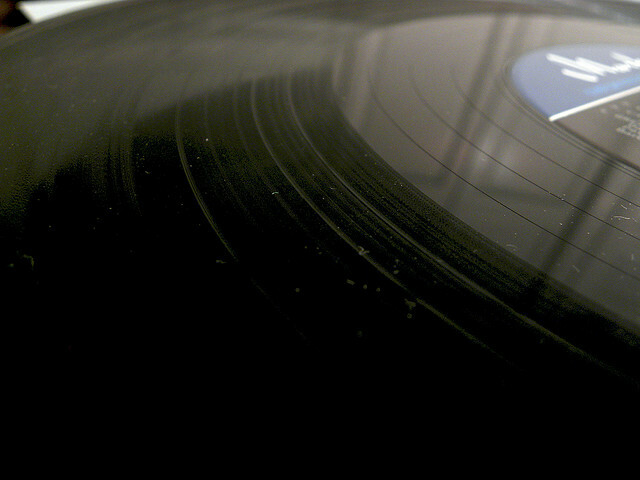 I wanted aural authenticity, even if that was just a by-product of the process of rendering sound onto vinyl. Whatever I heard, I wanted it to be the real thing. I toyed with the idea of recording the grooves of some other record and attributing it to one of those classics, but that would be too obviously disingenuous, and it would diminish the craft of the overall piece, which is something that I really appreciate about conceptual art in general. After all, if someone is going to listen to the inner grooves of Fugazi’s 13 Songs, that’s what they should hear. As a conceptual artist, I did not want to mislead my audience. After all, the watchword in audio reproduction is “fidelity.” But if you’re listening between or after the tracks, what are you hearing? The scrape of the needle on the record, the lingering artifacts that might come from either member of that evocative pair. It’s not music you’re hearing when you wake up from sleep, as the album spins silently away into the distance. It’s the record.